Recently I posted some pictures of the lid for my most recent bible box on Google + and some discussion about woods for carving and tools followed. One friend, Brander Roullett, (who writes his adventures on one of my favorite blogs Badger Woodworks and who has been working down a similar path of 17th century carving techniques) suggested I put up a post about the carving chisels I use. "Wow," I thought, "That's a pretty damn good idea." 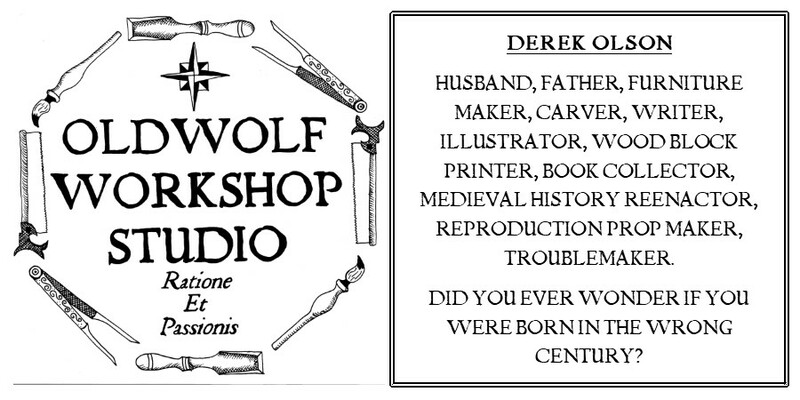 So here we find ourselves, at the gateway to the executive tour of Oldwolf Workshop Carving Set. Please remain in your seats and keep your appendages within the confines of the ride at all times. No flash photography please and hold all your questions until the end. First we'll start with the first two carving chisels I purchased. A pair of Pfeil chisels brought home from the Woodcraft store. It turns out the 45 minutes I spent agonizing over the multitude of choices present on the "Wall Of Pfeil" turned out well. The "V" chisel was a no brainer, but getting the perfect sweep gouge was moderately tormenting. I'm still happy with my one choice. It gave me enough to start playing with carving. In the next year Peter Follansbee released his first video on 17th century wood carving and I was raring to go. One of the area antique stores had a set of a dozen carving chisels hidden back in a corner, I had my eye on them for a long while and I finally couldn't resist any longer. Half the set is made from 6 Bucks Brothers gouges. There isn't a whole lot of difference in the sweeps, in fact They are almost 3 pairs of twins. The shallow sweeps on the left easily see the most use of any gouges beyond my V tools. I think the previous owner favored them as well because the bottom of one handle is pretty beat up. The remaining 6 from that set are a nice selection of old Miller Falls chisels. There is a couple different, deeper, gouge sweeps, including a couple smaller detail gouges, a goose neck chisel that is great for material removal, and a very elegant V chisel. I did have to replace one ferule that was missing. Then I have a small detail set of old Craftsman chisels. I only just recently got these off eBay and I haven't gotten to using them much yet, so the jury is out on whether they stay around or not. Finally I have a small selection of tools let's call pattern tools. One of these is a simple nail set, The others are old tool steel I modified myself. The tube was a leather punch, the cross shaped punch was an old beaten up alignment bar and the texture punches were an old beaten up center punch and cold chisel. You can read the post I wrote about creating the texture punches HERE. I wasn't completely happy with the texturing punches when I first made them, somehow I believed the marks they were to make should have been more vivid. But I have a bit more carving under my belt now, and a whole lot more looking at pictures of period pieces and comparing them to my work and the punches really do hold up well. Other tools that end up helping with my carvings are a scratch awl, sometimes to make a layout line and sometimes to make a round punched hole similar to what I do with the nail set or cross punch. Sometimes I also use a marking knife to carve in a fine detail or refine a line. The pencil helps because there are times I will take a period carving and use that as a jumping off point for my own direction, the pencil helps me layout my feelings and ideas without cutting into the wood, so I have a chance to refine the idea before I cut any wood. 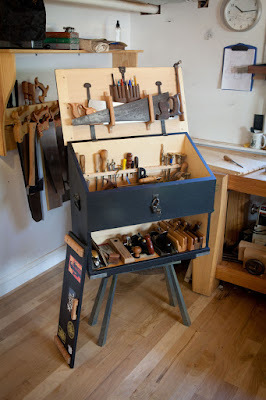 Add a mallet, hammer, square, several dividers, a marking gauge, and a little time and practice and you too can be carving. In all reality the kit I've been able to assemble here is more than a beginner needs and I am certainly not advocating that you build a kit just like mine. Hell, most of my kit was collected by another person years ago and I was simply lucky enough get my hands on it. There are a couple more things I'd like to get my hands on like a couple chip carving knives, and a larger goose neck chisel. A hook knife and a couple bigger gouges like one would use in spoon making would also fit in well with this kit. Beyond that though I'm pretty happy where I'm at, After all, more chisels just means more sharpening and less carving. Nice post. Lucky find on that carving set at the antique store. I've yet to see a single carving tool at any of the places I've hit around here. Most of my kit is build up from Pfeil chisels, one by one. I totally know that anxiety when standing in front of the Wall of Pfeil. If I didn't have the chisel set details from Mr. Follansbee as a guide, I don't know that I ever would have managed to purchase anything useful at all.